Temperatures in Washington and Oregon continue to be above average and much of the Pacific Northwest is experiencing severe drought. Go for a walk in the woods and chances are you’ll notice it’s a lot more dusty, the plants and trees are shedding leaves and dropping limbs; typically we’d expect dried leaves and dropped limbs after the first storms of autumn, but happening mid-summer these are are signs that the forest is trying to conserve water. Our forests are feeling the effects of these prolonged hot, dry days. At the landscape level there is increased risk of wildlife and at the individual tree drought stress decreases growth, increases susceptibility to pests and disease and contributes to mortality. Woodland owners, especially those who planted young trees this spring, are looking at how to mitigate the threats that drought stress presents to their forests. Saplings, or trees between 1-3 years of age, are especially vulnerable, and they require special attention due to competition stress and the vulnerability that comes with not having a strongly established root system. Fortunately, there are a few things you can do to help out your thirsty trees, including financially-frugal methods of watering and applying mulch. 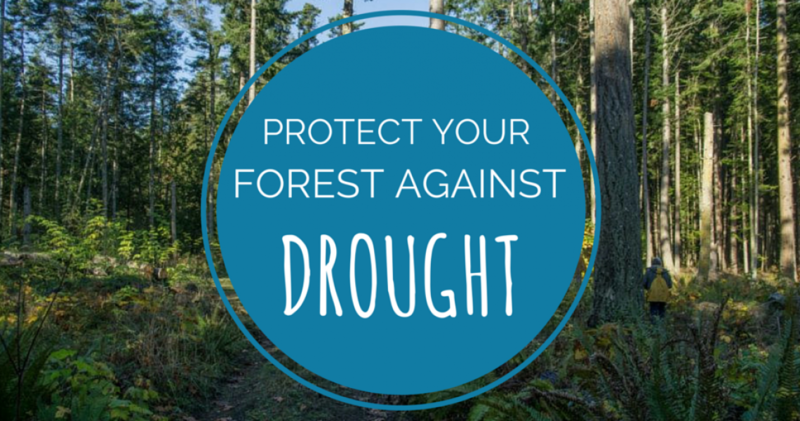 Below are ways to identify and mitigate drought stress in your forest. die-back or decline, or death of the crown of the tree. Note: although yellowing needles indicate drought stress, this does not indicate mortality. In normal conditions, plants release water through the stomata, small holes located on the leaf of the plant. This process, called transpiration, will occur during the day and eventually cease at night. During drought, however, the plant closes the stomata and ceases transpiration in an effort to retain the now-limited water in the soil. After prolonged periods of drought and no transpiration, photosynthesis eventually stops which causes energy loss and eventual death amongst trees. For more information on transpiration, click here. Diameter growth is powerfully affected by yearly water availability as well. The season’s tree rings will vary depending on water, and a drought can almost completely halt width-wise growth during the dry period and perhaps a few years beyond. “Collect some small twigs about one-eighth inch in diameter and try to break the individual twigs. If the twigs snap easily and appear dry, the tree may be dead. If the twigs bend and don’t break with a snap, the tree may still be alive. Watering: Watering your plants, especially younger trees and saplings, is the best treatment for drought stress. Obviously, acres of forestland cannot be watered, but if you are especially concerned about a small grouping of trees or young saplings, watering may be a good option for you. Note: Trees do not grow well in constantly wet soil, so make sure to let the earth dry out in-between waterings. Mature trees: make sure to water the ground within the “drip line” of the tree, which is defined as the portion of ground that is beneath the edge of the tree canopy, where rainwater would fall naturally. Click here for more information regarding different watering methods and prescriptions for watering according to tree size. Saplings: According to the Sacramento Tree Foundation, saplings should be watered to a prescription of 5-15 gallons a week per sapling. Saplings must receive enough water to their root ball, and the best way to accomplish this is to create a watering well around the tree of about 3 feet in diameter and 4-6 inches deep. More info can be found here. According to a study completed by Brooks et al., Douglas Fir and Ponderosa Pine use a process called hydraulic redistribution in order to store a reserve of water of 16-21 extra days after a 60-day drought. This means that these two species are able to keep better-hydrated than others and will use this store of water first before halting transpiration and experiencing other harmful effects of drought. 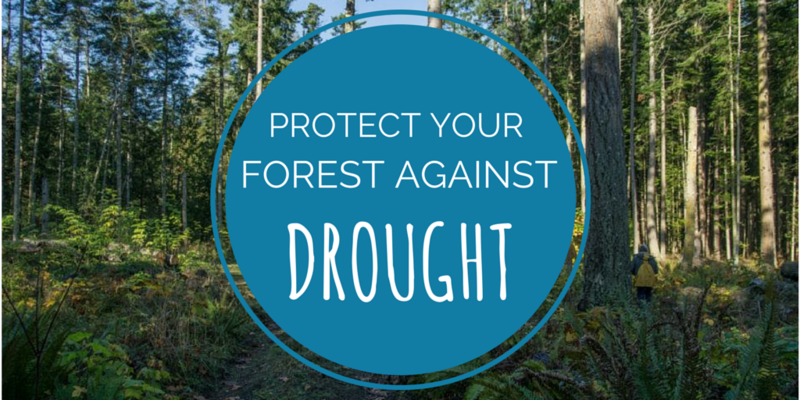 Keep this in mind as you assess the condition of your forest and decide whether or not watering is necessary. Reduce competition: Removing weeds, invasive species, and other competing vegetation will increase the amount of nutrients available to trees, thereby increasing the likelihood of tree survival, especially for seedlings. Pruning, perhaps: If disease has stricken your trees already due to drought stress, prune limbs of trees where obvious cankers are present to prevent further spreading of the pathogen. Do not over-prune, however. 2. Consider your soil temperatures: Although ground temperatures can get too low for saplings to survive, temperatures in excess of 85 degrees fahrenheit are too high for many species of trees such as firs (i.e. Douglas Fir and Noble Fir), and this will inhibit growth. In general, most PNW species do best in temperatures of 68-70 degrees, although Ponderosa Pines may prefer the temperature slightly warmer (Source). The forest floor is insular and therefore resistant to temperature change, often making it an ideal place for sapling growth; therefore, in very dry times like these, it is probably best for seedlings if they have some cover from mature trees to ensure that the soil does not get too hot in addition to too dry. Different soil types also have different capacities to retain moisture and nutrients. For example, soil filled with clay has the best ability to hold water, but it is slow to drain and air cannot access the roots well, whereas sandy soil does not retain moisture well but has good aeration. In general, it is best to plant in a loam-type environment. Soil types can be identified using the Green Seattle Partnership Field Guide (pg 37) or you can obtain soil information from NRCS using the Web Soil Survey here. 3. Consider your species: Knowing the environments in which individual species grow best is vital to success of the tree in general. This guide provided by WSU Extension provides incredibly useful information on the environments in which individual native species thrive and the identification of these species. Also check out this comprehensive guide by WA DNR on PNW forest types, their distribution, environment, and more. Try to find out what conditions your sapling was grown in as well – knowing whether it was grown in low altitude or high altitude, the seed origin and the nursery location will help you determine whether or not the tree is a good fit for your property. Brooks, R., Meinzer, F., Coulombe, R., & Gregg, J. (2002, October 1). Hydraulic redistribution of soil water during summer drought in two contrasting Pacific Northwest coniferous forests. Retrieved July 15, 2015. Fair, Barbara (March 2013). Coping With Drought. Retrieved July 15, 2015. Lopushinsky, W., & Max, A. (1990, May 10). Effect of soil temperature on root and shoot growth and on budburst timing in conifer seedling transplants. Retrieved July 16, 2015. Texas A&M Forest Service (n.d.). Effects of Drought Stress on Trees and Landscape Plants. Retrieved July 15, 2015.